Organophosphorus compounds (OPCs) are used worldwide as, e.g., flame retardants, plasticizers, and pesticides and remaining stockpiles of OPC nerve agents are present in military arsenals. These OPCs exhibit acute and potential chronic toxicity to man, the environment, and biota thus emphasizing the need for efficient analytical procedures to monitor potential risk to health. Therefore, this review discusses LC-MS-based procedures for OPC detection, addressing sample preparation, separation, ionization, and detection in comprehensive detail. For sample preparation conventional liquid-liquid extraction (LLE) and diverse solid-phase extraction (SPE) procedures are still used most frequently. Nevertheless, during the last three years a number of sophisticated novel methods have been introduced. Solid-phase microextraction (SPME), stir-bar-sorptive extraction (SBSE), membrane-assisted solvent extraction (MASE), and specifically designed molecularly imprinted polymers (MIP) exhibit high potential for frequent use in the future. Additional emphasis in this review is dedicated to the quite young history and current progress in ionization and MS detection of OPCs. The number of relevant published LC-MS reports has tripled in the last five years. This is especially due to the proliferating use of electrospray ionization (ESI), nowadays an indispensable and reliable tool for LC-MS coupling. LC-MS is becoming an appropriate complementary or replacement method for the more traditional GC-MS methods, and not only for non-volatile, hydrophilic, and ionic OPCs. The last section of this review covers recent approaches for verification of OPC poisoning. 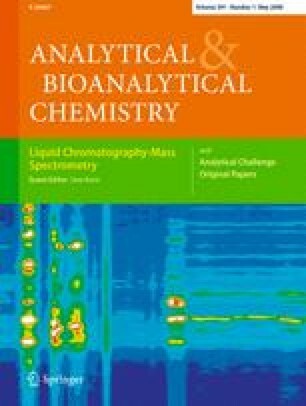 LC-MS-MS detection of phosphylated peptides generated from inhibited circulating serum butyrylcholinesterase (BChE) by valuable proteomics techniques enables proof of intoxication on the molecular level. Therefore, this review gives a comprehensive overview on the status quo of LC-MS-based OPC analysis in respect of both technical progress and relevant applications.